Token ecosystem is all about design. The economics of tokenisation (aka tokenomics) is part of this entire process. 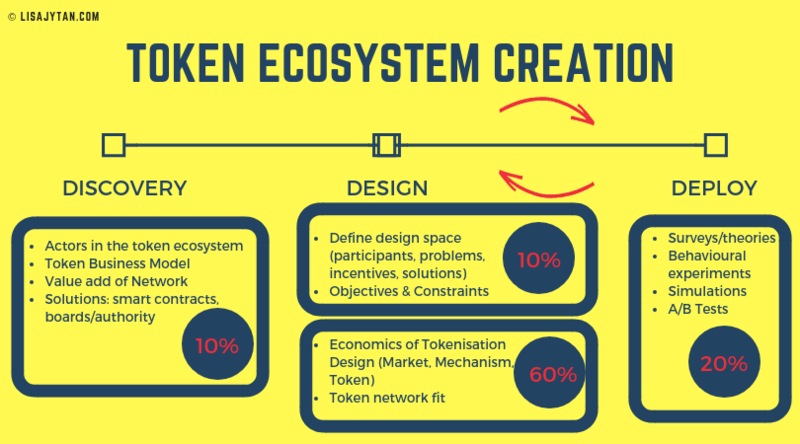 This article shares the Token Ecosystem Design process stages, elements to consider during each stage and where economics of tokenisation (aka tokenomics) fits in. So, this post can give you more ideas and information about the whole process, if you need help and what specific help you need. Token ecosystem is the entire system where your tokens and users co-exist. If you think about it, it’s basically your business model. The creation process comes in 3 segments: discovery, design and deploy. This is adapted from the 3 Ds of token ecosystem creation, created by Outlier Ventures. It’s easy to remember, and easier than a model I created previously. Discovery Phase: determine the particular characteristics of the business model or ecosystem and why a token is needed in the first place. Design Phase: making high-level design choices including, governance structures, the (mathematical) token model and its parameters. These need to be optimized for stakeholders’ incentives and the long-term sustainability of the associated ecosystem in order to avoid value leakage. It’s as simple as it can get. It is the execution that is really difficult. Step 1: Discovery stage. This stage is to understand the basics of your token ecosystem. A good way is to think of the various participants, the business model, what value you add and possible solutions. Step 2: Design (1/2) stage. This stage is to fully understand and agree on the most important objective of the token ecosystem. Then, you can expand to 2nd most important objective, 3rd most important, … Also, define the design space and constraints. This is very important because it defines the environment in which the tokens and participants will co-exist in. It also defines the environment that we will be designing, in the next steps. Step 3: Design (2/2) stage. This stage is where economics of tokenisation comes in (aka tokenomics). This is where the market design, mechanism design and token design comes in. The idea is to design each part individually, then combine them together and find a token network fit. Step 4: Deploy stage. This stage is to run various tests to test the token network fit in previous stage. Steps 3 & 4 are an ON-GOING CYCLE. That means, token network fit draft 1 —> deploy and run tests —> improve and create token network fit draft 2 —> deploy and run tests —> improve and create token network fit draft 3 … you get the idea. Where Does Economics of Tokenisation (Tokenomics) comes in? The economics of tokenisation comes in at the last half of this process, steps 3 & 4. In step 2, we define the outcome that we want from the token ecosystem. In step 3, we will design the various environment and mechanisms to achieve the outcome in step 2. Then, we run tests in step 4 to see if the outcome is achieved! If not achieved, return to step 3 to edit and test them again. The economics of tokenisation is not a one-off service. It requires time to research, test and analyse the right model for the token. I wish it was as easy as a cooking recipe, where you can take an existing model out there, and edit it to suit your ecosystem. The beauty of token ecosystem is that it is highly customisable to the outcomes we want. We just have to spend a lot more time understanding what it takes to achieve the outcomes. We all want answers, and we want them now. But the truth is that good things take time. I hope you allow sufficient time to design the right economics for your token ecosystem. It is not easy, but if we want to make real changes and define our future of tokenisation, we have to start creating sound economics right now. Feel free to contact me or inquire about my crypto services. And if this information is good enough, I wish you all the best for your token ecosystem! 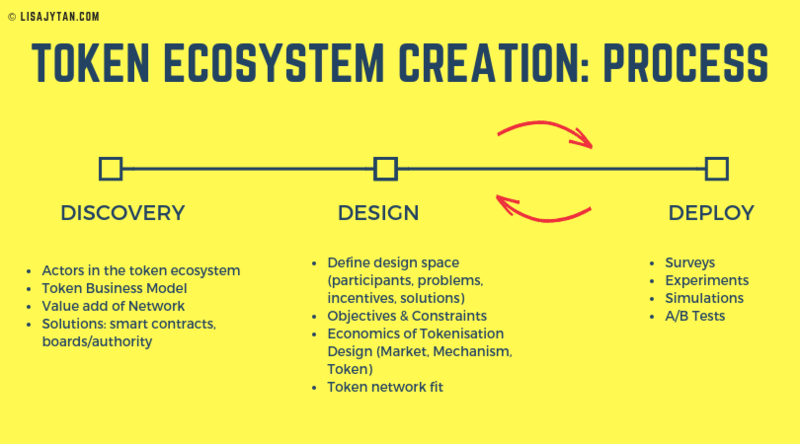 Ps: token ecosystem design and creation is like baking the perfect macaron. You can have the steps and general ingredients needed, but it is the details that really determines the success of it. Over whip, undercook, not resting enough, and it’s destroyed. Just like token ecosystem, the general steps is applicable to every project. To get the best success in the token ecosystem, you need knowledge and experience, that is less easy than reading an article.